More than 5,400 Emory employees participated in this year’s eight-week Move More Challenge. Here, faculty and staff from the School of Nursing take part in National Walking Day on April 5. More than 5,400 Emory employees crossed the finish line of this year’s Move More Challenge, walking over one million miles and taking over two billion total steps. Using a fitness tracking device to track their activity, set personal goals and “move more” with their co-workers, participants proved once again that Emory employees enjoy competition. This was the third year Emory offered the Move More Challenge to employees, and this year’s challenge brought many changes. For the first time, the challenge was offered on Healthy Emory Connect, Emory’s new platform that serves as the one-stop-shop for health and wellbeing programs. Employees were also able to use a wearable device of their choice, with many different options including Fitbit, Garmin, Apple Watch or even just connecting with a smartphone. Also new for this year, employees created their own teams with their co-workers to compete together. This spurred a lively competition among the 867 teams, with the top three teams surpassing eight million steps each. Selyka Givan, captain of the first place team, “Keep It Moving,” says that she enjoyed the team component, because her teammates held each other accountable through text and phone calls and would meet each other throughout the week to work out together. “Each team member played an important role and as a result, we lost weight, got healthier, formed a strong bond and increased our physical stamina,” Givan says. Another exciting enhancement to this year’s challenge was the virtual journey around Emory taken by each of the teams. The challenge started at Oxford College and teams progressed to nine additional Emory destinations, ending at the new Emory University Hospital Tower. As teams reached new destinations, they unlocked fun facts, saw beautiful pictures of the location as well as health and wellbeing tips. 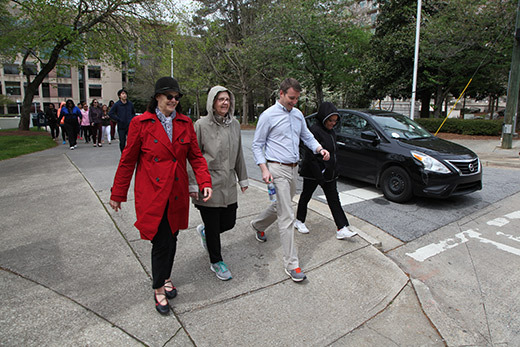 With the integration of Healthy Emory Connect, participants had an opportunity to earn points throughout the eight-week challenge period, March 5 to April 29. Participants earned daily points for tracking their steps and activities and also received bonus points at the end of the challenge for reaching certain step goals. All of these points added up on Healthy Emory Connect, helping employees to reach thresholds for earning medical plan incentive dollars. In addition, random prize drawings were held at the end of weeks four and eight for prizes such as Amazon gift cards, Fitbits and Apple Airpods. Across Emory, there were 88 employees who achieved over 1 million steps during the challenge. “The Move More Challenge was a huge success,” says Melissa Morgan, wellness manager. The challenge may be over for now, but Morgan says she hopes the awareness gained from the experience of moving more will stay in the minds of Emory employees. “Keep tracking your steps, look for ways to move during the work day, and find activities that you enjoy,” she says. Employees who haven’t purchased a Fitbit since Sept. 1, 2017, can still take advantage of Emory’s subsidy through July 31. New devices are now available in the Fitbit store, including the new Versa and Ace.